30 minutes. Headphones required. Eyes open or closed. Not suitable for looping. Includes full usage guide. This session gives you the power to boost your mood, lift your spirits and start having fun again. It’s a blast of pure happiness that’ll put a smile on your face, a spring in your step and a song in your heart. If you need a powerful pick-me-up that’s painless and non-invasive, this is the way to go. 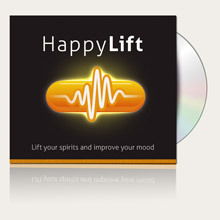 The name says it all – a variety of techniques to elevate mood and reduce anxiety, with frequencies throughout the alpha and beta ranges. This is an asymmetrical session that soothes the left brain (9-12Hz) while stimulating the right brain (12Hz, 16Hz, 20Hz). Give yourself an intense, exhilarating, blood-pumping workout! !